Now choose from three great options! From Tootsie Rolls, to Jays Chips (flavor will vary), to Famous Amos Cookies, to Fannie May, to Wrigley’s gum, to Planters peanuts, to candies, to chocolates, our Chicago box is filled with ‘Everything Chicago’! Great for conventions, welcoming guests and friends, this gift gives a taste of our Sweet Home Chicago. Our gift box is great for conventions, business meetings, and welcoming guests and friends. Packaged in our large box and combines Chicago treats and gourmet treats: includes tootsie rolls, two varieties of Jay’s chips, Famous Amos chocolate chip cookies, Wrigley’s gum, Planter’s peanuts, Lemonhead candies, Jelly Belly candies, cheese straws/biscuits, white-chocolate amaretto cookie, dark-chocolate wafer cookie, popcorn or snack mix, seasoned pretzels, dipping mustard, Goose Island root beer, and Belgian truffles. Packaged in our large box and combines Chicago treats and gourmet treats: tootsie rolls, two varieties of Jay’s chips, Famous Amos chocolate chip cookies, Wrigley’s gum, Planter’s peanuts, Lemonhead candies, Jelly Belly candies, cheese straws/biscuits, white-chocolate amaretto cookie, dark-chocolate wafer cookie, popcorn or snack mix, seasoned pretzels, dipping mustard, Goose Island root beer, Belgian truffles, a Chicago Skyline magnet, and a Chicago Skyline mug. Now choose from three great options! From Tootsie Rolls, to Jays Chips (flavor will vary), to Famous Amos Cookies, to Fannie May, to Wrigley’s gum, to Planters peanuts, to candies, to chocolates, our Chicago box is filled with ‘Everything Chicago’! Great for conventions, welcoming guests and friends, this gift gives a taste of our Sweet Home Chicago. Our gift box is great for conventions, business meetings, and welcoming guests and friends. Priced at $24.50 each; also available at $45 (Option 2), and $55(Option 3). Customization: Customize ribbon with your company’s name or greeting when you purchase 6 or more gift boxes. Message must be the same. See options below. Weddings/Family Reunions: This box can be customized with the bride and groom names and wedding date or family reunion info and the ribbon can be customized, too! See the ‘Wedding Guest Gift Box’. 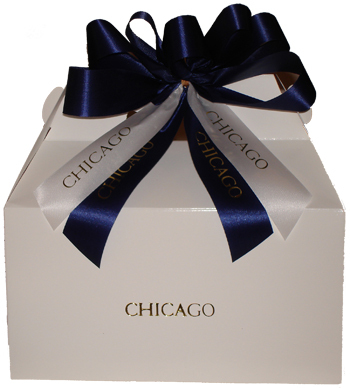 Also see our Chicago Sweets and Treats Box for a variety of gourmet treats.